Dear Thameslink, The first rule of breaking bad news? Don't pretend the bad news is good news. You see, I don't need to check before I travel to know what your oblique yet self-congratulatory blurbage about "changing to deliver transformation" is really getting at. 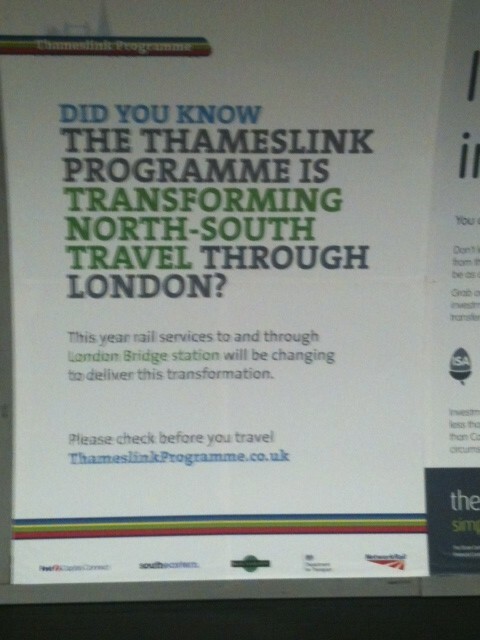 Namely, that the Thameslink programme is, indeed, "transforming" North-South travel through London. With four years of cancelled trains, closed platforms and, as your website puts it, the "retiming of certain route services" (aka, late trains). The typo gave me a laugh. But your trying to tell me how clever and hard working you are doesn't make me feel any better about the fact that for the next four years, the trains are screwed.